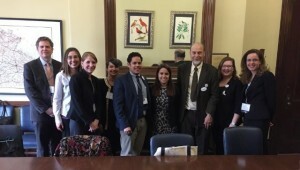 On March 30, about 70 social and behavioral science researchers, stakeholders, and advocates met with their Members of Congress and staff to advocate in support of funding for federal agencies and programs that support social and behavioral science research. Advocates from 23 states converged on Capitol Hill, completing 80 individual meetings. Materials used to help articulate the value of social science research are available on the COSSA website, including fact sheets on COSSA’s FY 2018 funding requests.